What do you think I am tablecloth crazy!!! Dragging out an old china favourite for Dom's scones. I get a teeny bit frustrated by Dom's reading of instructions and he gets a teeny bit frustrated by my not reading of instructions.....'If you had read the instructions...' is familiar resound in our house. PS: I am attempting to write a tutorial for a weekend bag that I have made.....taking a very long time about it - it will appear eventually. Thank you for letting me know about your blog - when I clicked on your name it tells me that I cannot view those pages. Would you have a link that I could click on please? YES!! 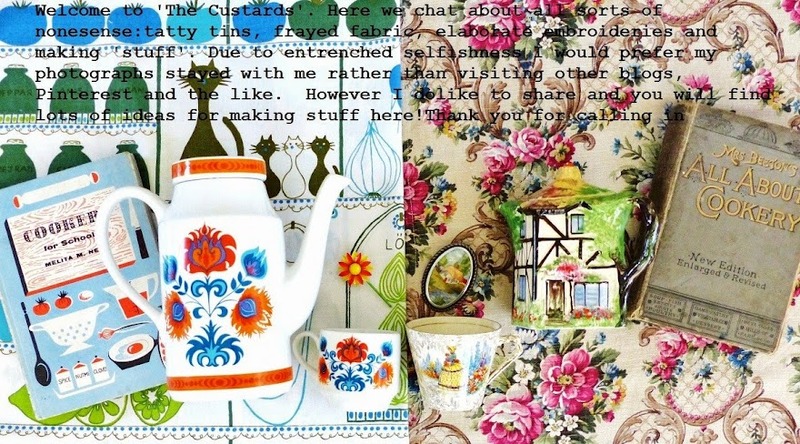 I Love reading about your crockery and tablecloths. often "Pop in " to see your treasures. Aww - thank you ella - I will keep going for now! I too love reading about your treasures. We take a tablecloth and matching napkins in our little picnic basket. Hurray - good for you Julie. Napkins is really pushing the boat out! love the pattern on your bowls. I'm jam-making today, seems like a good day for it! It has been wonderful having 8 weeks off! Thank you for kind blog words - I will do tutorial but not too happy about one that I have made so far so need to start again....tried to get my piping in a better order! Good grief that is a bit pricey - I have some old Schweppes crates that I bought for 5p each when I was about 10 years old.....what was I thinking!!!!! Thank you so much Jane - very kind of you to say so. You've spurred me on to make some jam, and we need to decide what to do with a tree that is groaning with Discovery apples. They don't keep - maybe a juice press is the answer. I often recall the days before second hand became 'vintage darling,' but sadly I didn't squirrel away as much as you did BVD. Maille looks delightful and yes, of course, all mothers do this (I do anyway) and get the same reaction! Please don't mention the C word ... I'm still on Summer time. Love your tablecloth and the circus dishes!! Your daughter is lovely. Takes after her mother don't you know......!!!! Selective photography helps I think! Dear Jenny I do so look forward to your posts,they cheer me up no end,LOVE that china.You have such pretty daughters.I always skim read instructions! !Have a good weekend TTFN Pam. i love your tabecloths, my dining room is so blahh its needs some TLC..off to save some pennies.. Wonderful post Jenny. Love your tablecloths and the crockery is amazing with the fairground scenes. Thank you Barbara - it is lovely china and I bought it from a charity shop whilst on holiday in Devon two or three years ago. It had been placed at the BACK of the shelf!! Now wishing I had a red tablecloth. And the long skirt is gorgeous! I never see dish patterns here in the US like you have collected. I have collected lots of sets of dishes that are more traditional patterns. Many pieces from England. LOVE Staffordshire! My fav!